Are you struggling to make the impact that you want to make in your business? Would you like to build your following through inspiring, educating and empowering your audience and clients? 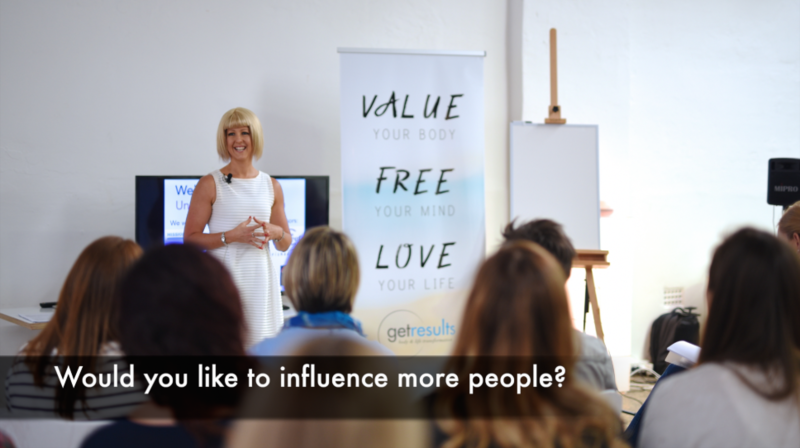 My 'Amplify Your Influence' workshops cover proven strategies to increase your influence, grow your business and reach more people with your message. Are you feeling tired, lacking energy, overwhelmed with all you could be doing but can't seem to find time to do it all? But at the Amplify Your Influence workshop, I give you 5 STEPS to increase your influence and results quickly ... so that you know exactly how to create the right opportunities, leads and revenue. Who Is Amplify Your Influence For? You have a business you want to take to the next level, or an idea or passion that you want to monetise. You want to make a bigger difference, make excellent money and get your knowledge out to people in a greater way while remaining your genuine, authentic self. You’ve been struggling to attract or retain your ideal clients and keep getting stuck (even though you know you could help many more people to improve their lives). You want your business to not only support you financially but to fulfill you and be aligned with your passions. You’re overwhelmed by all the information out there and want someone you can trust — who’s walked the path themselves — to give you answers and real-world solutions. These are some of the many things you learn at the Amplify Your Influence workshop.